^ This is so exciting! (Eventhough I can't make it) But I'm so happy for the girls. Their own gigs in France, Germany and the UK. And the small print says Apollo Main stage at Sonisphere on July 5th. Hopefully we'll get some recordings of the events. Anything important to know? I like the album, but never had time to research the group much. That's really good for them about the stage change at Sonisphere, although it does put a huge amount of pressure on the girls. Second stage on sunday to main stage on saturday is a really big deal. I hope they'll be ok. True that sir. Check atmospheriums avatar for a demonstration. With plenty of new footage from Budokan. That concert must have been amazing experience. Can't wait for the Blu-ray!!! Wow!, now that's a trailer. I thought it would be a great concert but this is amazing. I'll probably will get this concert on Blu-ray. I love it when Yui and Moa sprint during IDZ, and the band, it's another entertaining factor from that concert. I love the contrast between SUMETAL's solos and YUI and MOA's. "Rondo of Nightmare" (as they put in the video) is dark and powerful, and Suzuka always looks larger than life. 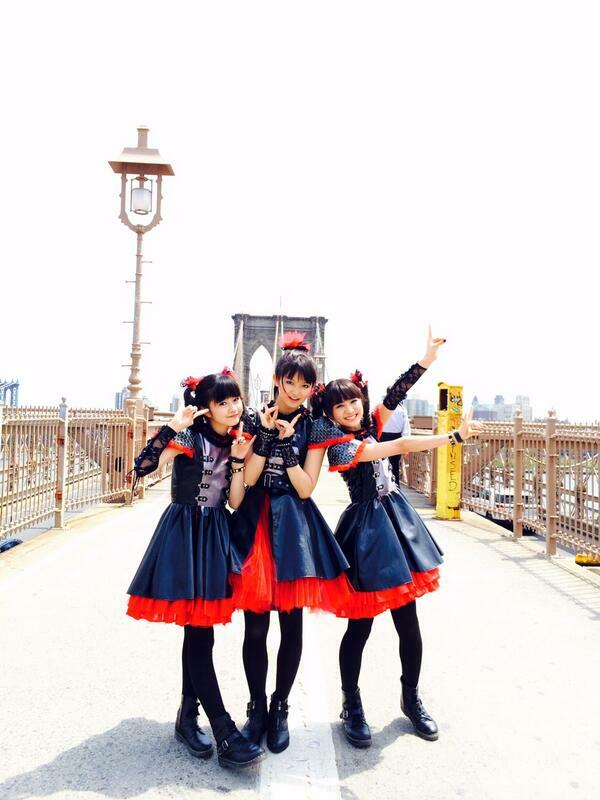 Then you have 4 no uta with Yui and Moa, and their cuteness level over 9000. It makes me appreciate the perfect balance of the group. And let's hope Yui and Moa are forever shorter than Suzuka so they don't mess up the triangle formation haha. 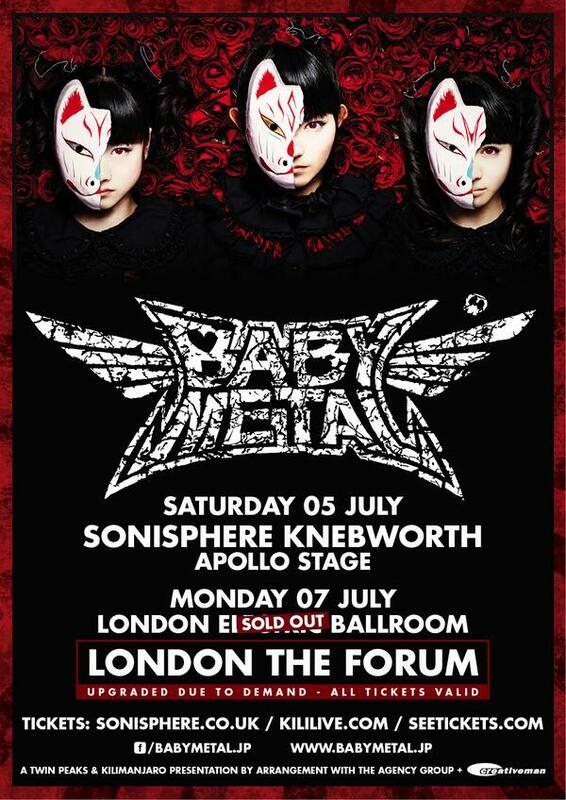 The Babymetal show at Electric Ballroom SOLD OUT immediately. The venue has been upgraded to The Forum, with twice the capacity. I love the fact that even thier own management is underestimating the audience-drawing power of Babymetal! I guess they didn't realize how much fans will be there. If they keep this up, the next concert will probably sold out too. Wow! :D That's amazing! Well done to them. I've been to the forum and it's a great venue. Big enough to fit a good amount of people but just small enough to still be personal, the standing area is quite wide and not that deep so everyone gets to be nice and close. And wide means an impressive wall of death is on the cards during I, D, Z. :D Last band i saw there was cannibal corpse and the wall of death was awesome. I can't imagine how small the electric ballroom is. :P Sounds like it would have been intimate but if it's half the capacity then that is small. I would have thought they'd think big, i guess they really don't know their power over here. I love their fighting sequences. She is damn adorable. She also has the perfect mix of cuteness and professionalism. She can execute dance sequences perfectly but still inject her own personality into them. My above gifs being a perfect example. They were in New York for a photoshoot and there's the rumor going around that they did some interviews. Her name is Dana Yavin, she the one that shot the photos at Babymetal's concert in Budokan. Here is her taking their photo shoot. But they are still awesome.